All kinds of equipment, vehicles and materials can transport invasive species to new locations. But felt has been the focus of attention for its ability to trap and transport invasive species. Studies have shown that sediment and invasive species can be trapped in felt. Used on fishing boots and other river shoes, felt is a porous material that can be difficult to clean and dry. Some management agencies have taken measures to restrict the use of felt to prevent the spread of invasive species. Keep in mind, other materials can also transport invasive species. We have provided a number of resources here for you to learn more on the issue of felt and invasive species. Whether you choose felt or rubber soled shoes, we advocate cleaning, draining and drying your gear. If you are in the area, visit any boot cleaning station distributed in the Greater Yellowstone Area. Cleaning: Does It Make a Difference? Since 2009 there has been an increasing move toward restricting the use of felt soled waders and wading boots. We have created this page to provide a single source of information about all of the felt bans in the USA. There are two basic approaches to creating these restrictions. In some states the bans are created through legislative action. That is, their legislatures have debated and passed a law that has been signed by the Governor. Other bans are created by administrative action. These bans are implemented by the action of a Fish & Game Commission, by Agency rule making authority or through other administrative action. Understanding the process through which new regulations are developed is important for anyone who wishes to have a voice in the process. The following tables offer a brief overview of the status of felt restrictions in the US. This page is updated with any significant changes in an attempt to provide a comprehensive listing of felt restrictions. If you have information about any felt restriction proposals that are not included please contact us with information. This page is current! We try to track every felt regulation in the USA and we update this page whenever there is new information available. Additional information: The Missouri Conservation Commission has approved a regulation change banning the use of porous-soled waders or footwear incorporating or having attached a porous sole of felted, matted, or woven fibrous material when fishing in trout parks and other specific trout waters. Pending public comment through the Secretary of State’s office, the new regulation will go into effect March 1, 2012, the opening day of catch-and-keep fishing at Missouri’s four trout parks. 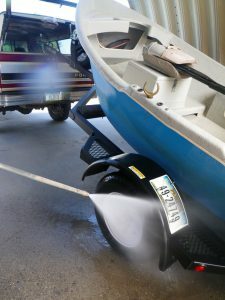 Proposal: It is prohibited that any person use foot gear with external felt soles in any state waters, inclusive of freshwater, tidal, or marine. This shall include any waters shared with adjacent states in which any Rhode Island Fishing Regulations apply. 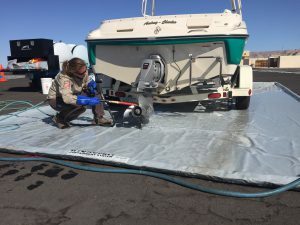 Resolution Idaho congratulates those fishing tackle manufacturers that offer alternatives to felt soles, for their foresight and efforts to offer products that reduce the threat and potential transfer of aquatic nuisance species. Other manufacturers, both domestic and foreign, are encouraged to engineer, develop, manufacture and sell similar products that reduce and/or help prevent the spread of aquatic nuisance species. Proposal Law states: The Department of Inland Fisheries and Wildlife in consultation with the Department of Environmental Protection shall examine issues related to the control of invasive aquatic species, including but not limited to the use of felt-soled waders and the spread of invasive aquatic species, and report to the Joint Standing Committee on Inland Fisheries and Wildlife by January 15, 2012. The report may include any recommendations concerning legislation. Additional information: Fish & Game agency requested approval from commission who tabled request. Additional information: New York City owns sections of many popular Catskill waters which supply water to the City.